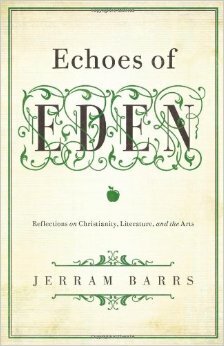 Echoes of Eden: Reflections on Christianity, Literature, and the Arts, by Jerram Barrs. Wheaton, IL: Crossway, 2013. 192 pp. $17.99. “The arts need no justification; they are good gifts of God, a basic part of the creation order. Our calling is simply to be thankful for these gifts of sub-creativity” (22). Jerram Barrs makes this bold statement at the end of his first chapter, immediately disclosing his philosophical stance on art. He writes this book as a directive to a Christian philosophy of the arts, expressing how he thinks every Christian should interact with, and consider the beauty of, the arts. Barrs argues that all humanity realizes the fallen reality of its nature and longs for redemption, and this is reflected in good art. His thesis states, “All great art will echo these three elements of Eden: (1) Eden in its original glory, (2) Eden that is lost to us, and (3) the promise that Eden will be restored” (26). He attempts to prove this by looking at several examples of literature he believes exhibit these characteristics. A professor at Covenant Theological Seminary since 1989, Barrs teaches apologetics and outreach. His education consists of a Bachelor of Arts in English Language and Literature from the University of Manchester and a Master of Divinity from Covenant Theological Seminary, where he currently works. He is a multi-published author, specializing in arts and literature. Barrs’s book can be divided neatly into two major sections. The first five chapters represent a detailed, outlined philosophy of the arts from a Christian perspective. In the final five chapters, Barrs turns his attention to demonstrating his philosophical assumptions through examining specific examples of literature. In chapter one God is portrayed as divine creator with humanity made in his image as sub-creators. Barrs also makes an argument against asceticism that will be outlined more thoroughly below. Chapters two and three present the artist as an imitator of God in creation and the specific calling on the life of a Christian artist. The reader is supplied with criteria for judging the arts in the fourth chapter, while the fifth connects the “Echoes of Eden” to general revelation found in biblical passages such as Romans 1. The second section of the book focuses on exemplifying these “Echoes” by analyzing the life and works of C. S. Lewis, J. R. R. Tolkien’s Lord of the Rings, a specimen of contemporary literature in the Harry Potter series, the world-view communicated by Shakespeare’s works, and the works of Jane Austen. After these illustrations, Barrs uses an appendix in an attempt to debunk an argument that would unravel his perspective on Harry Potter—that of Dumbledore’s homosexuality. The book includes a general index and an index of Scriptures cited. Barrs elaborately presents the approach Christians should have to evaluating the arts. One of the snares he warns against is that of asceticism: the avoidance of indulgences. While condemning this philosophy, Barrs consistently elevates the use of myth in literature. Barrs defines asceticism as the belief that it is unspiritual or sinful to find pleasure in our creaturely lives (17). He quickly rejects this concept as heresy and attempts to display creativity through art as a creation of God and thus good, stating, “The teaching that it is sinful to enjoy the gifts of creation is deeply blasphemous because it is a rejection of God’s own valuation of creation” (17). This ideal, he argues, can easily lead to an idolatry of self-righteousness if not kept in check and has been a temptation throughout the history of the church. This attitude is combated by Barrs’s insistence that God values his creation. He called it “good” from the beginning, but asceticism rejects God’s evaluation while faulting his work with corrupting mankind (17). Christians should esteem God’s handiwork on the same level he esteems it if they are to recognize the echoes of Eden hidden, sometimes unconsciously, in the very base of human constructions (18). Since beauty can and should be observed and enjoyed, asceticism is a fallacy. Barrs specifically acknowledges beauty in the form of literature and myth. He depicts Lewis and Tolkien in particular as lovers of myth and legend. Growing up enraptured by myths, the unbelieving Lewis was intrigued by Tolkien’s insistence that the gospel works in a similar manner to myth (93). The idea that created myths contain a kernel of truth underneath their unworthy outer husks was fully expounded when Tolkien wrote an essay that states, “The Gospels contain . . . a story of a larger kind which embraces all the essence of fairy-stories. They contain marvels—particularly artistic, beautiful, and moving” (107). Thus, when these men used myth as a method of communication, they were attempting to convey specific life truths on a base level of comprehension. The writings penned by both of these literary giants reflect the Bible’s account of creation, the fall, and God’s great work of redemption: the echoes of Eden cloaked in myth causing the reality of salvation to be evident to readers (117, 135). The philosophy of the arts presented in this book is articulated masterfully with references to Scripture and conclusive arguments. Barrs is well read, and his deep appreciation for literature is evident. He discusses aspects of the stories examined and the lives of those who created them in great detail. However, his love for these works often overshadows his arguments. Redemptive themes are often presented within the literature examined. Despite the lack of explicit Christian faith or worldview, the “Echoes of Eden” are contained in literature due to general revelation. However, Barrs proceeds to cause confusion as he labels certain authors Christian due to the “Echoes of Eden” found in their works. This weakens his argument by confusing general revelation with faith-driven intentions. For example, discussing Shakespeare, Barrs is quick to point out the lack of information available on the great playwright today but later labels him a Christian just as quickly due to the content of his material (155). He approaches J. K. Rowling in a similar manner by defending her decision to disclose that Dumbledore is homosexual. He explains away this blatant portrayal of sin by quoting that Dumbledore is ashamed of his past and there is no suggestion of sexual involvement between him and his partner (193–94). Barrs defends the claim of Christian content in Rowling’s work by dismissing this comment as a distraction from liberal criticisms. These examples succeed in depicting a fallen nature and a longing for redemption but shroud them so deeply in sinful actions that the behavior is almost glorified. Barrs’s book should be read by any Christian seeking to formulate a Christian understanding and philosophy of the arts. The information is accessible, while simultaneously profound. However, Barrs lets his zealous adoration for his favorite literature overshadow some very real problems in the end. These problems should not necessarily inhibit Christians from enjoying the presented literature, but care should be given to not simply label writers as Christian or say they write from a Christian worldview due to the presence of redemptive qualities within the work. Despite the shortcomings of his arguments concerning the content of the examined fantasies, Barrs’s enthusiasm for literature is contagious, causing the reader to desire to study the works discussed. As believers, we should not be surprised to find redemptive themes within artistic works whether they are created by Christians or non-Christians because God created humanity with an inner longing to be redeemed, and he has shown himself to all through the work of his creation. ‹ Volume 3 of Artistic Theologian now available!